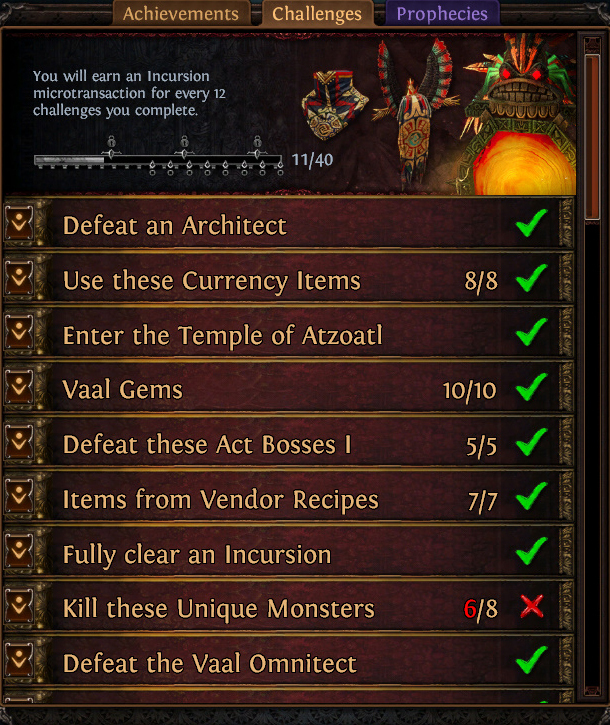 It’s been four weeks since Path of Exile’s new challenge league started, and I’m making good progress. By my pretty slow standards, that is. My Summoner is at level 81 now – just nine levels below my main character on Standard. I’ve finished the campaign at level 70 or so and started doing maps straight away. My supply of tier 2 maps and above builds pretty slowly though, so I’m doing mostly tier 1 maps at the moment, which are level 68, and xp gains have slowed down noticably. The character is now powerful enough to fully clear incursions most of the time though. One reason for that is a new type of monster I’m using as Spectres: Solar Guards. These bad boys have two kinds of attacks. The normal one is a fire damage projectile that does good damage at decent range. The real kicker is their secondary attack though. Every eight seconds or so they fire a big energy beam at a target area, which does a hell of a lot of damage after a short ramp up time. The first pack of monsters that comes into range just melts. They are pretty much Sharks With Frickin Laser Beams. Of the league’s forty challenges I have checked off eleven with another eight somewhere between halfway through and nearly finished. I will not manage to get the required 36 for the exclusive portal effect, that much is certain. There are substantially more than four challenges that lie well beyond what I can hope to achieve. It’s a shame because the portal looks very nice, but not ‘I’m willing to play 24/7 for three months straight‘-nice. The lower-tier rewards don’t interest me that much, but I’m not in it for the rewards anyway. I’ll just try to finish as many as I can in a reasonable amount of playtime. After all it’s one more carrot to chase, and I’m actually curious how far I can get. Speaking of carrots, the RNG gods were in a particularly good mood yesterday. 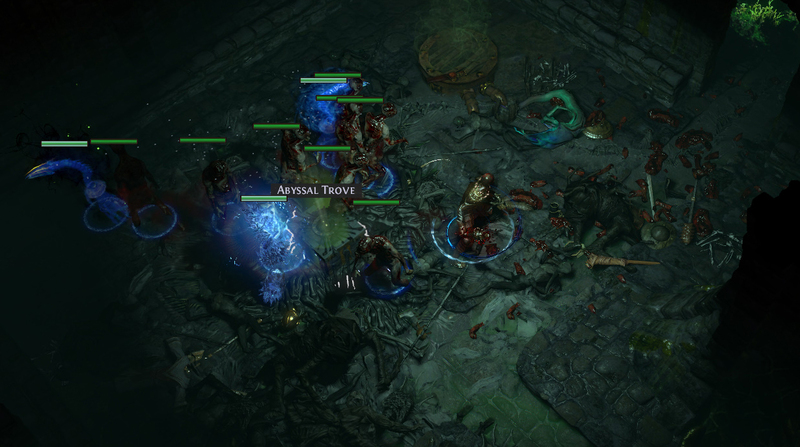 In my whole time playing Path of Exile before Incursion I had found exactly one Exalted Orb. They’re rare, is what I’m saying. My second dropped about one week into the league. Yesterday evening two dropped within half an hour! I still can’t quite believe it. Truly a sight for sore eyes. Exalts are one of the rarest currency items and are generally used as the main high-end trading currency. They also have gameplay purposes you can use them for of course, but most players (at least those as poor as me) only use them to trade for items they wouldn’t be able to afford otherwise. I guess I’ll hold on to them until I have a clear idea what to use them for. In any case I’m really happy to have found them. Overall I’m still having much fun playing this league. There’s one downside to playing the same character build in both Standard and a challenge league though: after the league ends you basically end up with twin characters on Standard, making one of them redundant. The other day I had a Eureka-moment about how I can still benefit from that. 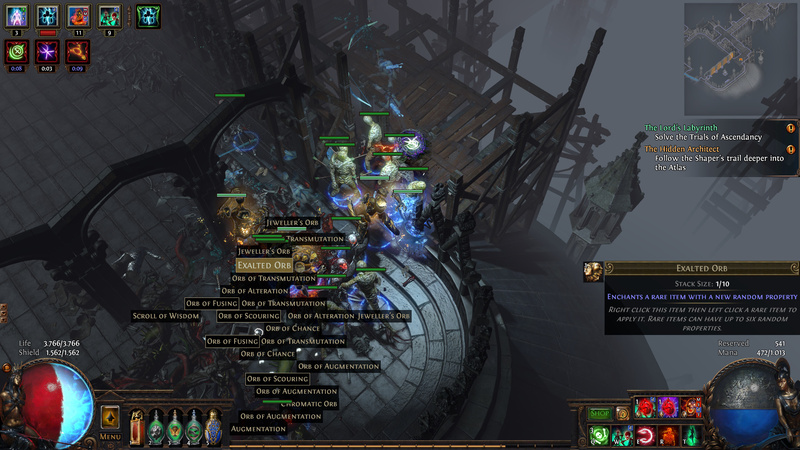 Shortly before Incursion started I found The Baron, a unique helmet with special properties for Summoners, on Standard. It’s bonuses revolve around making physical-damage-dealing minions in general and Zombies in particular stronger, but it requires the character to have a very high strenght stat to fully exploit its properties. This makes just switching to this helmet on a high level character rather inconvenient, you’re much better off building from the ground up for it. I’ve decided to play my Incursion character with her current build until the league ends, and after her migration to Standard I’ll shelve her until the next optional passive tree reset comes around. These are generally given out to all characters every time the tree is changed. Then I’ll build her around The Baron. That way I can continue to use most of the minion skill- and support-gems I’ll have leveled up during Incursion while trying a different flavour of the Summoner achetype. This is doubly great because it also gives me something to look forward to for after the league has ended. On June 6th 2017 I wrote my first (and second) blog post(s). I had been reading fellow gamer’s blogs for quite a while and been thinking about writing myself more than once, but never got around to it until then. I didn’t have a specific plan in mind, just that I wanted to write about things that interest me and occupy my thoughts. My target audience: myself, first and foremost. As I said in my first post, I want to capture and hold on to events that delighted, fascinated or just amused me. 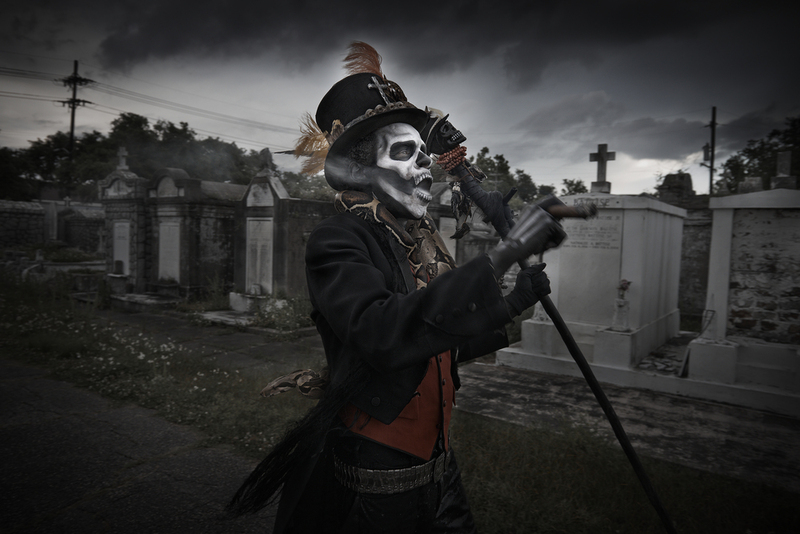 If anyone happens to stumble upon my musings and finds reading them worthwhile I’m all the happier of course. 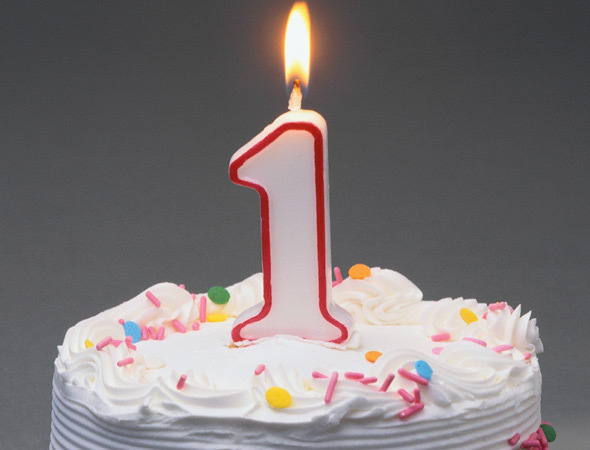 The first year yielded 34 entries, almost one entry every ten days on average. This is of course much, much less than most bloggers produce. The main reason for that is my pretty high personal threshold for what’s interesting enough to be written about. While I like to read about fairly mundane things (if it’s done in an appealing way) I very often deem stuff that happens to myself not worthy to write down. 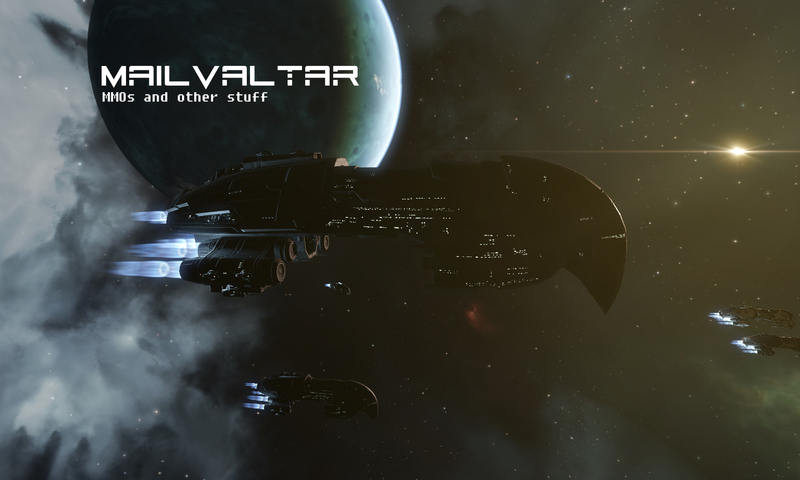 I just can’t imagine myself or anyone else being interested in reading about how I did my dailies in Path of Exile for the umpteenth time or that yesterday’s EVE Online fleet went largely uneventful. But maybe I’m just not as capable an author as the good folks whose blogs I always like to read, no matter the contents. If I do write about something I usually use a lot words though. If WordPress offers a total wordcount of all posts combined I can’t find it, but I’d estimate that I wrote about 800 – 900 words per entry on average, which would sum up to about 29.000 words. That’s not as much as it sounds (an average novel clocks in somewhere between 50k and 100k), but if you had asked me 15 months ago if I’d be willing to blog almost 30k words within a year I would probably have declined politely but decisively. It seems that I don’t want to talk about stuff very often, but when I do want to talk I like to be thorough (Lakisa would probably use the word ‘exhaustive’). Unsurprisingly the majority of posts were about the games I played. 13 were at least in part about EVE Online, 10 about Black Desert Online, 4 about Overwatch and 2 about Path of Exile, which more or less reflects the time I spent playing these games during that year. 8 were about broader gaming topics like player-made music, randomness or toxicity in multiplayer environments. 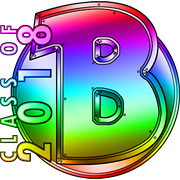 I haven’t talked much about non-gaming topics at all yet, but maybe I’ll get to that during this second year. I’m really glad to have started this blog. Writing is a lot of fun, lets me practice my English and, most importantly, preserves events and experiences I might forget about otherwise. A big Thank You to all bloggers who inspired me to do this, to Lakisa for reading it all and encouraging me, and to everyone who also takes the time to read it. Cheers! 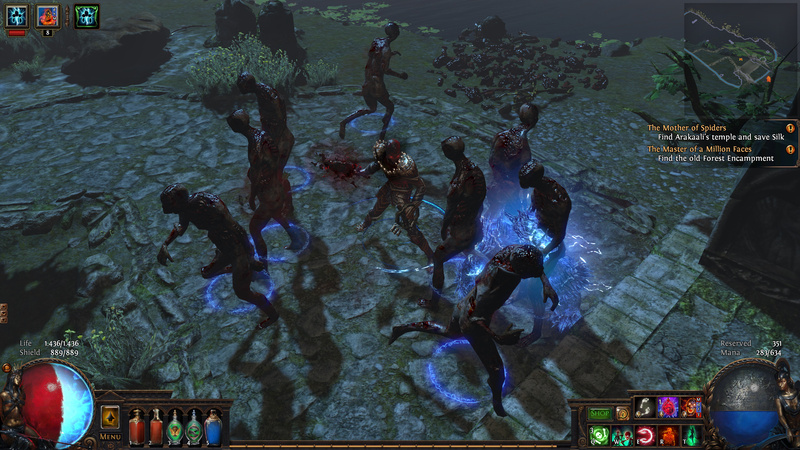 About three times a year a new three-month challenge league kicks off in Path of Exile. Every participant starts at zero, without access to their high level characters and well-stocked stash. As the name implies there are challenges to overcome and in doing so exclusive prices to be earned. 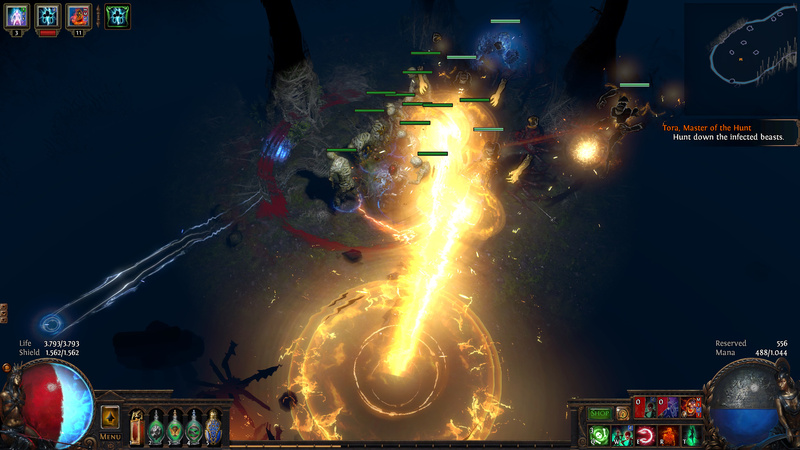 While many games do something like this to keep the playerbase entertained, Grinding Gear Games go the extra mile by introducing a new kind of game mechanic for each and every league and making that new content a central part of the experience. Most of the time these new mechanics have proven to be fun and rewarding gameplay elements and were subsequently added to the game as a whole after the respective league ended, albeit with a much lesser probability to spawn in any given area. There have been lots of challenge leagues by now, hence a great many interesting mechanics have made their way into the game. Despite being ‘just’ an ARPG and basically being about nothing but killing hundreds of thousands of monsters, the game has reached a point where it never gets boring. Well, to me at least. I’m not the fastest or most efficient monster slayer and loot collector though, so starting over multiple times a year was never really a viable option for me. I made my first character in the Ambush League when I started playing the game over four years ago. After that league ended and my characters were converted to Standard I actually never played in another challenge league until now. This time some things were different. My main characters in Standard are pretty much at the end of their (reasonably obtainable) progression, and while just playing the game is fun and all, progression as a motivator is not to be underestimated. Also the new league looked even more interesting to me than the ones before. 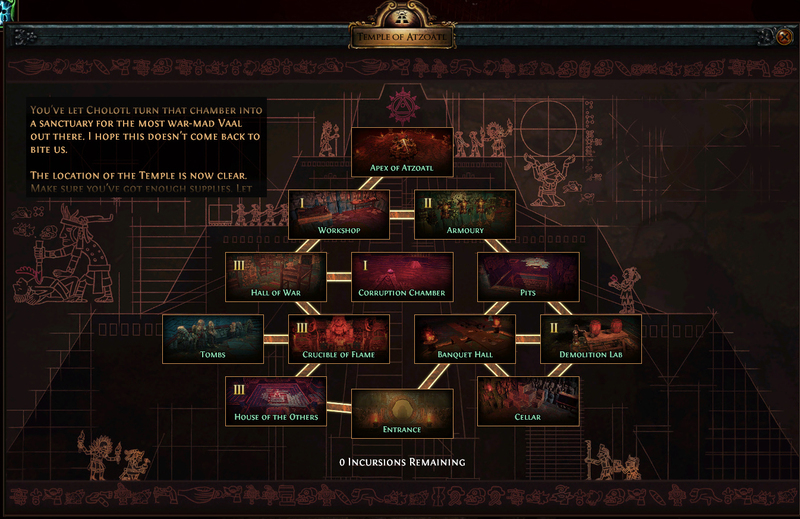 The new league is named Incursion and has an Aztec theme going, which already appeals to me aesthetically as well as historically. The mechanics are also pretty cool. In almost every area (this will be toned down a good bit later in the base game, I’m sure) you meet Alva Valai, an archaeologist of sorts, who is searching for an ancient temple’s location. She can teleport you back in time to one of the temple’s rooms while still under construction. There you have to fight its inhabitants and, depending on what you do, alter layout and properties of the finished temple. There’s always a pretty narrow time limit and mobs don’t always drop the keys you need to progress in the way you had planned, but it’s fun either way. After eleven incursions Alva pins down the temple’s location in the present and travels there, taking you along for the ride. The temple is huge and can be rather challenging (at least on lower levels). The rewards vary, as always, but until now I always felt it was worth my time, and, more importantly, pretty fun. I decided to again play a Summoner Witch for this, although I have a high level one on Standard already. I just like the playstyle so much and know it in and out, so I know exactly what I can and can’t do with her. How much fun is starting over, then? Pretty darn fun, I have to say. At first I was a bit annoyed by not even having the barest necessities available (like enough Scrolls of Wisdom to identify everything I picked up), and by my Zombies dying too often. But from level 15 or so I got into the groove again, and also started to feel the motivation that stems from progressing left and right, all the time, in one way or another. There’s always the next character level, another cool quest reward, another new item, oh, now I can have a personal hideout again, all while doing incursions and shaping the next temple run to my liking. I had completely forgotten how hard it can be to obtain gear with the right amount of linked sockets in the right colours so you can use your important skills with the strength they need to have for you to succeed. Once you’re used to having hundreds or even thousands of Orbs for crafting your equipment just right you forget how it feels to not have them. Astonishingly this has been one of the most fun aspects of starting over for me. Swapping out an ok piece of gear for a worse one just because the latter has one more gem socket is a bit weird, but also feels kind of cool if it lets me socket the gems that I want. It reminds me a lot of Magic: The Gathering sealed-deck tournaments. Having to make do with what you get instead of having your vast collection of cards at your disposal can be really satisfying if it works. 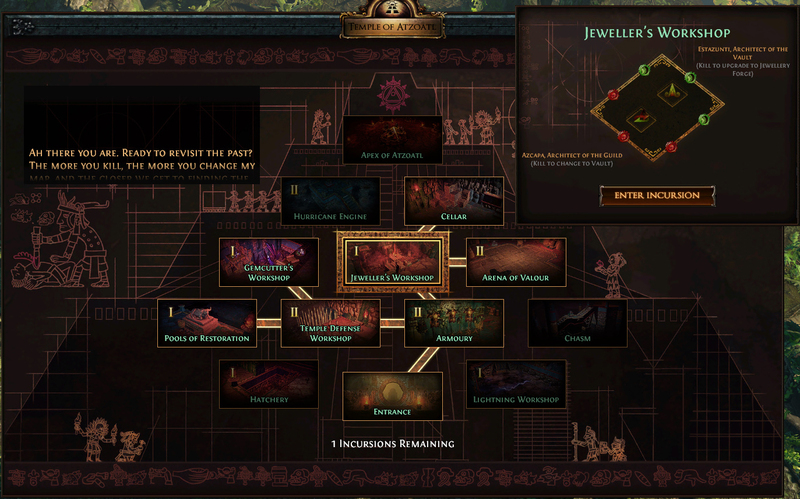 I don’t regret diving into this new league, and I’m eager to see how many challenges I can complete until it ends.